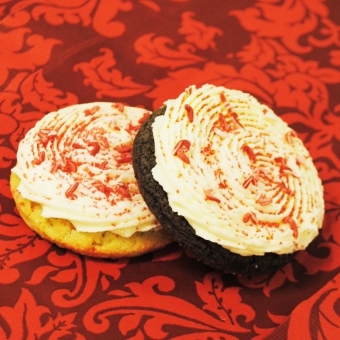 Our Peppermint Sprinkle comes in our vanilla or chocolate shortbread cookie. Both versions are topped with our rich creamy peppermint buttercream frosting and candy shaped and flavored decorettes. These are seasonal and are available from November 1st through January 5th. Size: -- SELECT -- Peppermint Sprinkle 10 ct.Peppermint Sprinkle 20 ct.Peppermint Sprinkle 30 ct.Peppermint Sprinkle 60 ct.Peppermint Sprinkle 90 ct.